Every winter we hear from homeowners and maintenance pros who ask about using Clog Hog sewer jetters to remove frozen blockages from sewer drain lines. Thawing frozen sewers and drain lines is a common use for Clog Hog sewer jetters, but there are a few extra precautions you should take. When clearing a frozen drain line it’s doubly important to maintain a clean water supply, since a clogged jetter nozzle can stop your forward progress in frozen pipes. You can help ensure your water supply is clean by running water through all supply hoses before you attach the jetter, and by checking all open coupling ends to be sure they’re free of dirt and debris. Keep the sewer jetter moving and water flowing through the jetter while the jetter is inside frozen pipes. Never run a gas-powered pressure washers indoors, since engine exhaust fumes are dangerous in confined spaces. 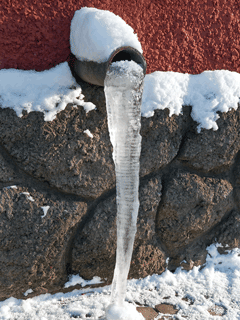 Drain the jetter and all supply hoses of water immediately after use to avoid damage from freezing water. Clog Hog customers also ask whether it’s safe to use heated tap water for the water supply. Clog Hog drain cleaners for cold water pressure washers are rated for continuous use with water up to 120 degrees Fahrenheit; this is equivalent to the hot water supply temperature in most homes. Clog Hog also sells specially-rated sewer jetters for hot water machines. Some cold-water pressure washers are rated only for water up to 100 degrees F. Before attempting to use your household hot water supply for sewer jetting, check your pressure washer owner’s manual for the machine’s temperature ratings and test the temperature of your hot water supply with a cooking thermometer.